The aim of the “Speicherstadt digital” project is to make Hamburg's Speicherstadt digitally accessible to all. A new app offers historical photos, background information, radio plays and Augmented Reality (AR). Fraunhofer FOKUS has developed the AR function for the app. The app “Speicherstadt digital” is available for the operating systems Android and iOS. It is free of charge and vividly conveys the history of Hamburg's UNESCO World Heritage. Many historical photos bring past times of the historic Speicherstadt to life. They come, for example, from the archives of the Stiftung Historische Museen Hamburg, Hamburger Hafen und Logistik AG (HHLA) and the Staatsarchiv. Explanatory texts and eyewitness accounts tell us more about the development of the Speicherstadt and daily life there. A map view allows a quick orientation and shows where there are places of interest. Anyone can use Augmented Reality on their own smartphone or tablet to make a direct comparison between today and then. 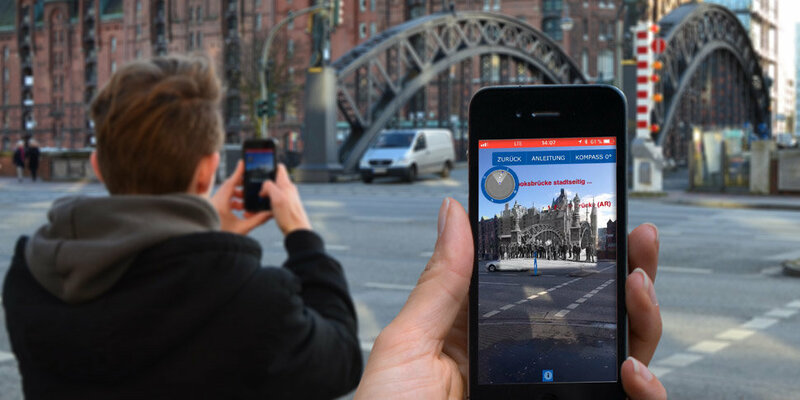 Visitors who view their surroundings through the app will be shown historical photos and can experience what the Speicherstadt used to look like. All AR locations in the Speicherstadt are marked in the map overview of the “Speicherstadt digital” app. When the user switches to AR mode, the display switches to the current camera view. Here he can select the AR location, to which he is then guided by GPS-based arrows. If it is close to the target, a mark on the path indicates the so-called “sweet spot”. This is the optimal viewing point of the selected image. If the user stands close to this point, the historical photo fits perfectly into the current camera image. The sensors in the mobile device, such as the electronic compass and tilt sensor, are used for both navigation and perspective adjustment of the image. In addition, transparency effects are calculated at the edges of the image so that the overall image is as seamless as possible. The FOKUS researchers have developed the AR mode in the app - from the user interface to GPS-based navigation to the sweet spot and perspective image adjustment. “Speicherstadt digital” was initiated by the Department of Culture and Media. Numerous cooperation partners have worked on the project: Department of Culture and Media, Dataport, Stiftung Historische Museen Hamburg, Norddeutscher Rundfunk, Google Arts & Culture, Fraunhofer FOKUS, Hamburg Hafen und Logistik AG (HHLA), HITeC, Hamburg University of Applied Sciences (HAW), IG Kulturquartier, University of Hamburg and Wilhelm.tel.